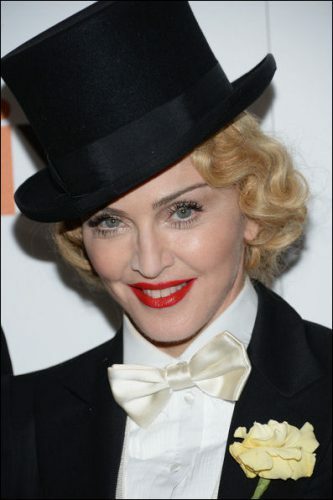 Celebrity makeup artist, Sammy H. Mourabit, was inspired by Marlene Deitrich’s iconic 1930’s look from the movie “Morocco” used Votre Vu products to create Madonna‘s look for last night’s premiere of Madonna: The MDNA Tour documentary at the Paris Theatre in New York City. 1. He first applied Attentive Crème de Jour for Sensitive Skin on the face and Portrait Collar Restorative Neck Crème on the neck to hydrate the skin. 2. Then, he dabbed Love Me Deux Concealer in Champagne under her eyes and also on the darker areas of her skin to even out her skin tone. 3. For a dewy look, he mixed the Love Me Deux Nourishing Moisture Tint in Champagne with the Attentive. 4. Mourabit accentuated cheekbones by contouring them with Beaute en Bronze Tantalizing Bronzer Duo. 5. He created a 1930’s eyebrow by first grooming with a brush. 6. Then, he applied the Arch de Triumphe Daily Brow Definer in Warm inside the natural eyebrow line. The thinner line captures that 30’s look. 7. To cover excess natural hair, he dabbed some Love Me Deux Concealer in Champagne, giving the illusion of a clean groomed eye without the need for over-plucking. 8. For the lips, he first contoured them in a heart shape reminiscent of the 30’s style with the Drawmatic Lip Liner in Naked (available in September). 9. He then mixed two shades of the French Kiss Moisture Riche Lipstick (available in September) for a luminous and voluptuous effect. He applied the darker tone, Margaux, to the outer lines of the lip and the lighter tone, Annette, to the inner lip. 10. Mourabit used Eiffel Power Mascara only on the center of the eyelashes. To intensify the 30’s look, he added some false lashes to the outer corner of the eye. 11. Lastly, he used Vu-On Rouge in Bouquet Rose on her cheeks and a little bit of the Belle Poudre HD Sheer Face Finish in Light. To get Madonna’s look from the actual tour, check out the video tutorial HERE!